How many tragedies like the horrible events at Ohio State must we allow to occur before we take action? Have we forgotten the bloodshed in Akihabara? How many more innocent, defenseless people must be injured and killed by knives? Knife violence is one of the biggest problems facing the US today, and the proper course of action is clear: we need an Assault Knives Ban. These are assault knives. They are designed to slash and stab. 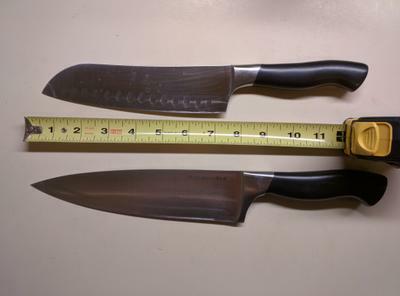 The one on the top has two assault features: a blade longer than 5 inches and a blade that is wider than the handle. The one on the bottom has three assault features: a blade longer than 5 inches and wider than the handle, plus a pointed tip. You do not need either of these knives to cook or eat. 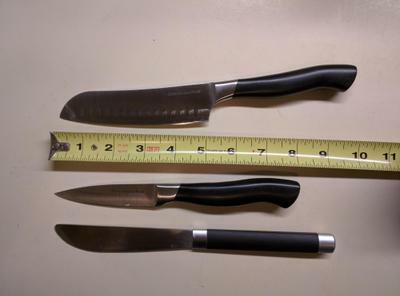 A ban on assault knives would prohibit any knife with a blade longer than 5 inches and any blade that has a pointed tip or is wider than the handle. Rounded tips prevent stabbing, and short blades prevent limit the knives' effectiveness as weapons. A blade no wider than the handle forces a murderer to risk injury to himself (from his hand sliding down over the blade) when attempting to stab someone. Ideally, an Assault Knives Ban would make all schools and Universities knife-free zones, too. Food would be prepared by licensed and trained professional chefs in a high-security environment. Chefs who could demonstrate a clear need would still be able to use assault knives while at work, but these knives would be stored in secure lockers when not in use, and removing one from the food preparation facility would be a felony. The knife security measures in place at such facilities would be regularly audited by local law enforcement. But don't worry, cooking enthusiasts! Nobody is going to confiscate your existing assault knives. You will have to register them, and you will not be able to transfer them (no, not even as inheritance), but you will be able to keep them for the rest of your life. The knife at the top is not an assault knife because it has a rounded tip and a 5 inch blade. Although the middle knife has a pointed tip, it is not an assault knife because its blade is less than 5 inches long. The bottom knife is not an assault knife because it does not have a sharpened blade but instead has an "abrasive ridge". Cooking enthusiasts can still do everything they want to with these knives. They can cut a pepper or a tomato. They can spread butter. They can carve a turkey. What they can't do is attack our children at school. I think we can all agree that now is the time for common-sense knife laws. Let's put an end to the epidemic of knife violence. Tell your Congressional representatives to support an Assault Knives Ban!